Similar to a garden shed, utility sheds are the perfect addition to a backyard for storage and hobby needs. Imagine how easy it will be to access your outdoor equipment and household tools with extra storage available. Besides small hand tools, they can store lawn mowers, tractors, and various other gardening supplies. Plus, they are a great option for storing gasoline, pesticides, or herbicides since these items shouldn't be stored indoors. Add one of our utility shed plans to your backyard and instantly discover an easy gardening solution. 450 Sq. Ft., Width 15'-0", Depth 30'-0"
122 Sq. Ft., Width 17'-0", Depth 12'-0"
168 Sq. Ft., Width 14'-0", Depth 17'-0"
196 Sq. Ft., Width 14'-0", Depth 14'-0"
151 Sq. Ft., Width 19'-0", Depth 17'-0"
180 Sq. 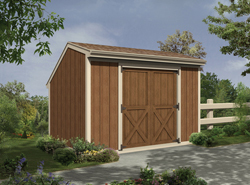 Ft., Width 12'-0", Depth 15'-0"
Our collection of utility shed plans includes many styles and sizes perfect for your storage needs. We offer easy-to-read blueprints that allow the buyer to picture the finished project. With a wide variety of plans, we are sure that you will find the perfect do-it-yourself project to fit your needs and style.